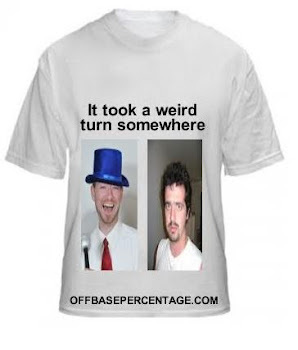 A few times a week Offbase will recap the day in Spring Training. We'll call it Putting a Stamp on Camp until we think of a better name. Let's start with a flashback from our buddy Jose Canseco, unofficially the Offbase mascot. We can't get enough of this guy. The Yankees had some controversy on their first day of camp! Unbelievable, I know. Why must people keep bothering this quiet, little franchise? Can't everyone just let them go down to Tampa and train in peace? Anyway, C.C. Sabathia hinted Monday there was a chance he could opt out of the final four years of his contract and test free agency after the 2011 season, even though he had said previously he wasn't going to do that. If Sabathia opts out, it's the right thing to do because he could get a new and longer deal on the open market after the '11 season, and he'll still be younger than Cliff Lee, who was the prize of this past winter's free agency class. I also think the big lefty would end up staying with and extending his contract with the Yankees because he likes playing in NY. So, Anthony in Poughkeepsie and Vinny in Jersey should put the whale sounds CD on and have a canoli. Meanwhile, in Jupiter, Albert Pujols set a new deadline-Wednesday-for the Cardinals to sign him to a new contract or he's playing the 2011 season and then testing free agency in the winter. Here's Cards manager Tony LaRussa talking about Pujols and distractions and engine coolant. First jab at a Redsox in 2011. Baseball is back! Tomorrow: what's so great about Jacoby Ellsbury anyway? There were thousands of Bautista-Brady Anderson comparisons last year, but Anderson had two more really good seasons after he hit 50 home runs in 1996 (which bested his career high in long balls by 29). I say we leave poor Brady Anderson out of this and start making some Dan Pasqua comparisons. Great call on the Canseco video. I could watch that on loop a solid dozen times a day. Knowing that you love Canseco like I do, we have one more thing in common. Have you seen 'Jose Canseco Baseball Camp twitch remix' on YouTube? It's golden. I have not. But in 4 seconds I will be able to say I have.